LUXAFLEX® System 2000 Awnings provide flexibility and are perfect on homes that are more than two stories high to allow for a consistent visual aesthetic. Manual operation for ground and lower level awnings, where access is easy, can be integrated with an internal winch or motorised remote controlled awnings on upper levels for ease of operation. In fact there are over five different methods of operating a System 2000 Awning, rope, tape, automatic, crank or motorised options are available. They are available in a wide choice of colours and styles from Canvas, SolShade, Acrylic and Aluminium, making System 2000 Awnings a flexible alternative. Spanning widths up to 4.2 metres and drops of 3 metres almost any exterior space can be catered for. The System 2000 Automatic Awning coordinates with the Pivot Arm Style, which are suitable for ground floor applications. They operate on fixed guide rods with easy function self locking arms. Available in a large selection of fabrics and colours including sunscreen and aluminium skins, Straight Drop awning – rope operation (for verandahs). A perfect choice for close fitting to windows on the ground floor or onto a balcony. LUXAFLEX® Automatic Awnings minimise space with its minimal projection. Easy to use self locking arms allow simple adjustment by hand or by a pull stick. LUXAFLEX® Automatic Locking Arm Awnings are a very popular design to provide you with an affordable solution to shade and protect your windows to keep your home cool in summer. They operate on fixed guide rods with easy function self locking arms. LUXAFLEX® Rollamatic Awnings operate on guide bars with various stop positions from fully closed to fully open. 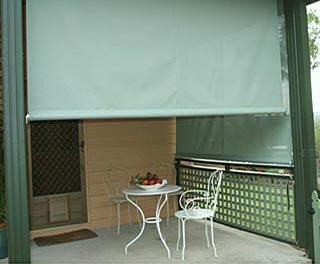 It is an easy hand operated awning, ideal for sun protection and privacy for balconies, patios and verandahs. The LUXAFLEX® Rollamatic Awning can also be used for upper level balconies, providing a simple but effective window application that is easy to access and operate. LUXAFLEX® Fabric Awnings offer fashion with practicality. 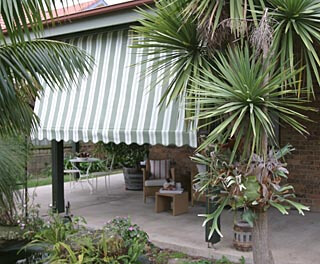 They are made from high quality, Australian-made, Hunter Douglas canvas to achieve the maximum exclusion of heat and light possible in an awning. Available in over 39 fabric designs. Treated to provide mould and mildew resistance. High quality cotton and polyester blended canvas for high tear and tensile strength. Solaire acrylic fabric is also available in all awning styles. Fully imported from Europe, this range features 29 fashionable fabric designs. There is a large range of LUXAFLEX® Window Fashions awning styles to choose from: Canopy, Roll up, Folding Arm, Robusta, Straight Drop, and the award winning System 2000. SolShade Fabric can also be used for Straight Drop and System 2000 Awnings. It is made with a PVC coated polyester with heat and UV control properties to resist fading. System 2000 roll up awnings are the latest in sun protection products for your home. With streamlined looks, effortless operation and a huge variety of installation options, the LUXAFLEX® System 2000 Awning has to be the most versatile awning system available. Winner of an Australian Design Award. Available in 3 styles: “Automatic” – allowing close to window shading, “Pivot Arm” – offering projected arm shading, or “Straight Drop” – allowing the fabric to hang vertically. The pivot arm style offers a choice of 5 operating systems; external rope control, interior motorisation, interior or exterior crank and tape control, or internal tape winch control. Available with sun, wind, rain and temperature sensors and timers for automated operation of your awning. Available with an aluminium skin (except motorised operation and straight drop styles). A LUXAFLEX® Folding Arm Awning is a retractable awning which provides an extension to your living area by providing shade and is particularly suitable for patios, terraces and floor to ceiling windows. Fixed or adjustable pitch options allow you to choose the shading angle required. For a European look a LUXAFLEX® Canopy Awning are available in nearly infinite number of shapes, making it a truly custom-made product. Available as either fixed or retractable (only available if projection equals drop). Q: What sort of protection do LUXAFLEX® Fabric Awnings provide? A: They provide effective protection against UV rays, heat and glare by preventing the sun’s rays directly striking windows. Q: Where should LUXAFLEX® Fabric Awnings be installed? 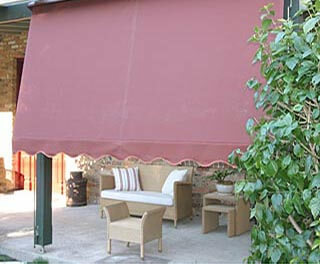 A: There is a range of fabric awnings to cover every need. For example, the LUXAFLEX® Folding Arm Awning is specifically designed to cover large patios, poolsides and terraces, without the need for upright posts. Q: Can fabric awnings be left out in all types of weather? A: No, we recommend that awnings be rolled up if rain is expected. However, you should avoid rolling up the awning while the fabric is wet. Q: Can the awning be left out when it’s windy? A: The LUXAFLEX® System 2000 awning was subjected to rigorous wind loading tests by the CSIRO. However, during extreme wind conditions all retractable awnings should be rolled away. Q: How long does the awning fabric remain waterproof? A: All canvas products should be re-coated with a water repellent annually, which is available through most camping stores.